Building on the work of the Fall seminar, we devote the Spring semester to individual research papers. The instructor will guide the students through the process of finding a topic, developing a research question, and finding sources in the first month of the course. Students go to archives and libraries in the middle of the semester for independent research while meeting with the professor and blogging about the process and their reflections. They will conduct research on an ongoing basis. They will learn story-specific research skills, including: mining primary sources in archives, finding secondary sources in circulating libraries, and developing historiographic reviews of relevant literature. In addition to group discussions of each other’s work, the students will meet with the instructor for one-on-one advising on their projects. Students are also encouraged to work with an additional specialist in this history department or, if appropriate, another discipline. Students will spend the last third of the semester writing and sharing their work. Students must produce a substantial research paper by the end of the Spring semester and will need to complete all of the writing assignments and blog posts associated with that outcome. We won’t meet nearly as frequently as a class during the Spring semester. Students will need to attend all scheduled class sessions (including the “Behind the Tweets” event) and individual meetings. By the end of the Spring semester, students will be able to: a.) research primary sources in historical archives and find secondary sources in circulating libraries from which they develop a historical argument b.) write an original piece of historical research and c.) speak with confidence in a public forum about their own research and pose questions about their peers’ projects. 14 January: No Formal Class Meeting. First Blog Post Due by 11:59pm: Explain your research topic. 16 January: Introduction to Zotero and share preliminary research topics. **Sign-up for individual meetings to discuss fall film paper. For next week: Start thinking about your research questions for the 2nd blog post. 22 January: Second Blog Post, Due Tuesday by 11:59pm: Introduce readers to your topic, the five questions that you would like to ask of it, and where you are looking to find sources for your topic. – Some must be articles (try “Article Quick-Search” on the library web page) and some must be primary sources. – Start reading some of the articles, books, etc. available in Cudahy Library. – Immediately order articles, books, etc that Cudahy Library does not have through Inter-library Loan. – Explore the possibilities in Chicago for archival work. 28 January: No Formal Class Meeting – Due in Professor Shermer’s mailbox by 4pm: Bibliographies, which should be divided into 2 parts: primary sources and secondary sources. Bibliographies should be annotated to briefly explain what that source is, its potential relevance to your project, the status of obtaining this source, and status of reading/taking notes on it. 30 January: Discuss how topics have been defined, research questions honed, and bibliographies built. Be prepared to discuss your topic with the class explaining how you moved from your interest in the broad subject to the specific topic. 3) A report if you met with a department specialist to discuss your topic. 4) An outline of the scholarly article posted on Sakai that labels the sections expected in a scholarly article. 5) A reflection on how this scholarly article’s structure differed from long papers that you have written for past classes and an explanation of what this article showed you needed to be in this Spring semester’s research paper and how it should be structured. 4 February: Be prepared to discuss the structure of scholarly articles, note-taking techniques, & reading/using primary sources. Don’t be miffed if we don’t get to your primary source. 6 February: No Formal Class Meeting. 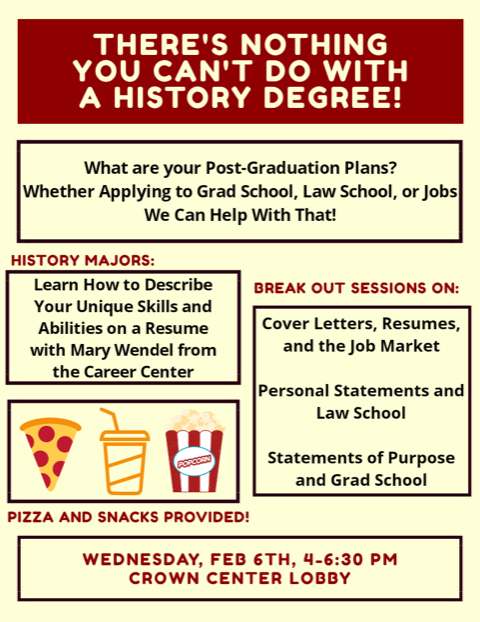 Students are encouraged to come to the History Department’s Undergraduate Career Night, 4-6:30pm, in Crown Center Lobby. 11 February: No Formal Class Meeting – Work on project/attend individual meeting with Shermer/Oram! 13 February: No Formal Class Meeting – Work on project/attend individual meeting with Shermer/Oram! 18 February: No Formal Class Meeting – Work on your project! 20 February: No Formal Class Meeting. Work on your introduction & detailed outline due on February 25th. 25 February: No Formal Class Meeting. Due in Professor Shermer’s mailbox by 4pm: Introduction & Detailed Outline. Bring several copies to 27 February class. 27 February: Meet to discuss & share introductions and outlines. 11 March: No Formal Class Meeting. Due in Professor Shermer’s mailbox by 4pm: A chunk of your first draft. This section should be copy and pasted into your introduction and outline. Please be sure to edit your introduction and outline to show how your project is evolving as you research and write. 13 March: Class meets at 6pm in IES 123 for presentation of Dale Winling’s Chicago Election Project. Afterwards Ramonat Scholars are invited to dinner at 7:30pm with the speaker. 17 March: Fourth Blog Post, Due by 11:59pm: Reflect on the process of starting to write your paper. What was satisfying about the experience? What was frustrating? How do you see your ideas evolving? What did you see in Dale Winling’s talk that gave you ideas about how digital sources and projects could be used with your research project? 18 March: No Formal Class Meeting – Work on project/attend individual meeting with Shermer/Oram! 20 March: No Formal Class Meeting – Work on project/attend individual meeting with Shermer/Oram! 25 March: Due in class: First draft. We will briefly meet to go over the peer review exercise. 27 March: No Formal Class Meeting – Work on your project. 31 March: Fifth Blog Post, Due by 11:59pm: Write about the process of creating the first draft of your paper. What was satisfying about the experience? What was frustrating? Where do you think you need to do more work? 1 April: No Formal Class Meeting – Work on your project. 3 April: Class meets to discuss editing tips & tricks and to sign up for individual meetings with Shermer/Oram. 8 April: Peer review due by 4pm in Shermer’s mailbox. No Formal Class Meeting – Work on project/attend individual meeting with Shermer/Oram! *Any student who wants Oram or Shermer to look over new or edited drafts or sections should email those materials at least 24 hours before their scheduled meeting. 10 April: No Formal Class Meeting – Work on project/attend individual meeting with Shermer/Oram! 14 April: Sixth Blog Post, Due by 11:59pm: Write about your experience of receiving feedback on your first draft from both the instructors and your peers. Explain your plan and process for revising. 15 April: No Formal Class Meeting – Work on project! 17 April: Class meets at 5pm to go over guidelines/suggestions for paper presentations and audience participation. The rest of the time will be devoted to individual meetings with students wanting more guidance from Shermer & Oram. 18 April: Seventh Blog Post, Due by 11:59pm: How is the revising process going? What have you been doing to incorporate the feedback from the instructors and your peers? What was satisfying about the experience? What was frustrating? Where do you think you need to do more work? 28 April: Eighth Blog Post, Due by 11:59pm: What was your experience giving your oral presentation? Reflect on your experience with the class as a whole. Members of the History Dept., administrators in the College of Arts and Sciences, and other faculty will be invited. Please invite your family and friends. There will be refreshments.